I have been procrastinating whether to take part in the Frida Kahlo challenge at Art Journal Journeys hosted by Susi. I have to admit (and I can hear all the boos from every corner of the world!) that I was not really into her art. I went to her exhibition in Wellington when I was an art student and we had to write an essay about her. Maybe that dampened my thoughts on her work. I found her life story fascinating, but……. I was going to do a whimsical picture of her, but in the end felt she deserved a decent picture showing her immense strength throughout her tragic life. I only used a part of the quote in the picture as it is rather long, but of all her quotes this is the one that resonates with me! Wow Sharon- this is amazing! Stunning Frida Sharon! I'm glad you made her so beautiful! So many people don't! Great quote too..! Well done - I can see Frida! Hi Sharon this is a wonderful tribute to Frida. I love the strength of this piece. Well done. Absolutely wonderful! :) Happy PPF! I think your Frida is strong and beautiful. I am not a fan of Frida. I admire her as a strong person, but there is something about her countenance that disturbs me to look at. Maybe the eyebrows since I had to fight bushy eyebrows as a young woman. Silly, I know. Thanks for your post. I enjoyed the visit. 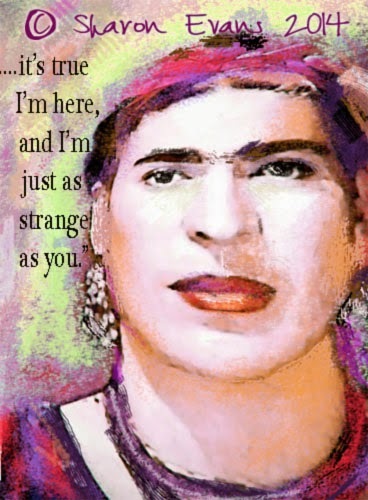 Your Frida is beautiful...and that partial quote is perfect. This is a beautiful piece, it attracts and has great character! What a wonderful painting and fabulous quote! I never knew how strange I truly was until I went on my first plein air painting trip where there were 80 other artists. By the end of the first day, I stared in amazement and thought, "THESE are my people! They are exactly like me!"